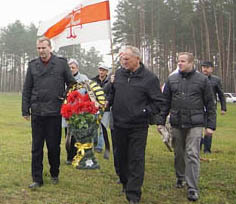 Member of the United Civil Party (UCP) Uladzimer Shytsikau received summons from Homel Navabelitski district Court for consideration of the administrative case, according to which the head of Navabelitski department of public order, lieutenant-colonel Henadz Khilkievich accused the public activist of violating the mass event order. The court trial in Homel Navabelitski district court is scheduled for December 10. - The summons is connected with my participation in the rally in memory of the victims of Stalinist purges. The event was held in Homel on November 3. Together with other activists I laid flowers and wreaths and lit candles around the crosses that were installed in the field of mass murders of people in the years of Stalinist repressions, – said U. Shytsikau. Let’s remind that on November 13, judge Siarhei Novikau (Homel Navabelitski court) fined the deputy chairman of the United Civil Party Vasil Paliakou with 4.5 million roubles (35 basic units) for taking part in the rally in memory of the victims of Stalinist purges. The activist is appealing against the fine in Homel Regional Court. In spring Vasil Paliakou and Uladzimer Shytsikau were punished with large administrative fines for laying flowers to the place where a historical figure Paluda Badunova lived. After have trying all domestic remedies, the activists failed to protect their rights within the country. Now their complaints were taken to the UN Committee on Human Rights.